Toytracer was a project from UC Irvine's Advanced Computer Graphics class. We were presented with an outline of a raytracer, called Toytracer (details about which can be found here) and were required to implement additional functionality. First we had to become familiar with the design of the program and then were to add ray-plane intersections, phong shading and reflection. 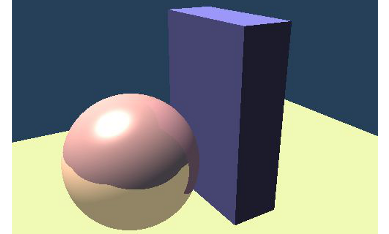 The program used a custom description language for scene files which were then rendered into still images by the raytracer. My report document for the class covering what was implement, what challenges were faced as well as snippets of code can be found here.